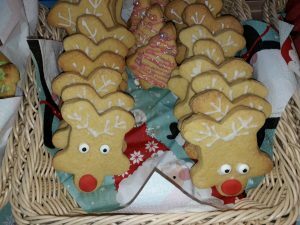 We had a very merry Christmas lunch on Wednesday 5th December, courtesy of our cook, Mrs Hopper, and her amazing team. We were surprised to learn that the team had a new member to help on the say, Elf-is the Elf. 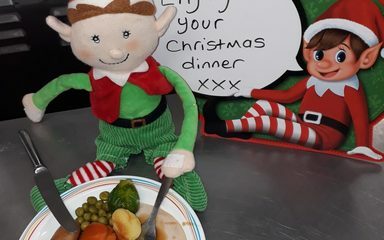 Here he is enjoying his turkey lunch – though only after all of the children had been served, of course! Thank you Mrs Hopper and the team for such a tasty lunch. We were all very full afterwards! Well done to Mrs Hopper and her girls. 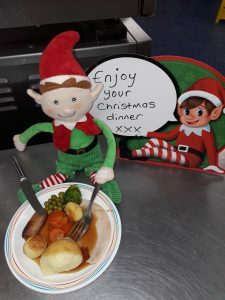 The Christmas lunch looked yummy. 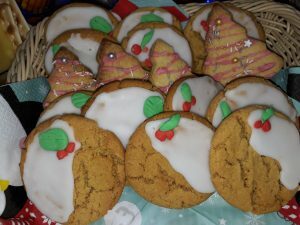 The biscuits for pudding looked especially delicious with lots of different designs.